CARLTON is adamant it has unwavering faith in coach Brendon Bolton as it prepares to turn to Matthew Kreuzer and Jack Silvagni in its search for an elusive victory. 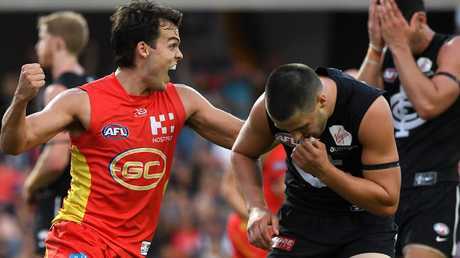 The Blues' loss to Gold Coast was a comedy of errors as they handed the Suns half a dozen chances in the final two minutes before Jack Bowes finally converted. But head of football Brad Lloyd told the Herald Sun the club was united behind Bolton despite his record of only 15 wins in 70 games at Carlton. "There is going to be scrutiny at this time, which is what comes with the start we have had, but there is a lot of belief around the group. We just aren't consistent for long enough," Lloyd said. "We need to improve but there is a really strong belief across the football department and the whole club. We just need to get some reward." 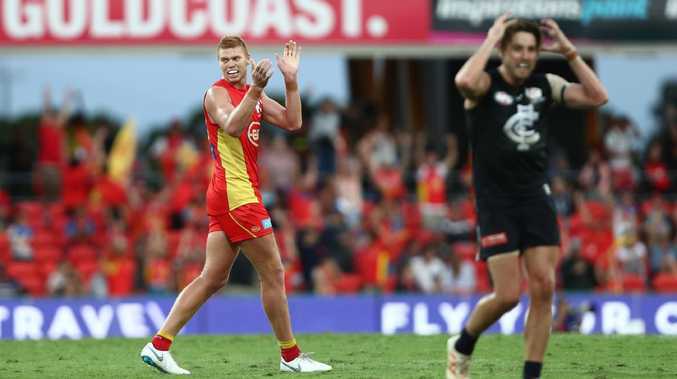 The Blues haven't scored 80 points in 18 games and have issues with midfield-forward connection, horror skill errors and organisation after tactical breakdowns late against the Suns. Bolton's unique rolling contract will give the club a chance to assess his prospects at season's end, but the club hierarchy remains staunch in support of him. "He is certainly hurting from the game but the type of character he is, he came out swinging (Monday) and was ready to go and attack the week," Lloyd said. "He is a strong, resilient character and has shown good leadership through the year. He will dig in and get back into it." Worryingly for Bolton, the club has half a dozen players in career-best form - including Patrick Cripps, Harry McKay and Liam Jones, as well as high-profile recruits - but continues to struggle. On the bright side, No.10 2018 Draft pick Liam Stocker is certain to make his debut against the Western Bulldogs on Sunday after a 121-ranking point best-afield performance in the VFL. Putting his explosive speed and beautiful field kicking to good use, he looked in commanding form with 15 possessions, 27 hit-outs and a goal. He should add real grunt to the midfield. Silvagni would also seem a likely inclusion after a 90-ranking point game that included two goals, 20 possessions and five tackles. 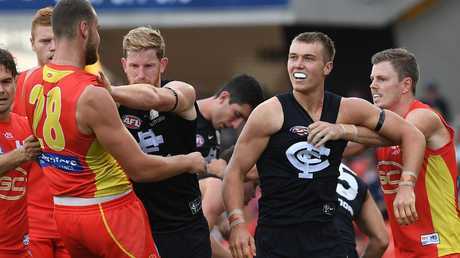 The Blues have continually tried to kick to small targets Michael Gibbons and, in round three, Cam Polson despite an array of key position targets. Alex Fasolo has had little influence in the senior side and is listed for a test after a back spasm early in the VFL last week. The club will need to make a priority of a Jamie Elliott-style mid-sized forward who can regularly kick goals at the end of the season.